SKETCHBOOK UPDATE - GO NEON! Aye aye! Started as a school project for designing letters, I had to make a capital A-Z, and all numbers 0-9.. We had to testprint all of them in different words and phrases to check if its readable enough. I was addicted instantly, designed my font and.. I made it work! Didn't expect it was so easy, because back in the day I've tried this with an other font editor (Something like FontLab) and it didn't go well at all. Glyphs is quick and easy enough to understand the interface in a couple of hours, and export a font that is actually usable from your .ai illustrator file. Check it out, a Mac app is available from the App store (budget app) but this was made with the trial version from the website, which is usable for 30 days. Thats nice! 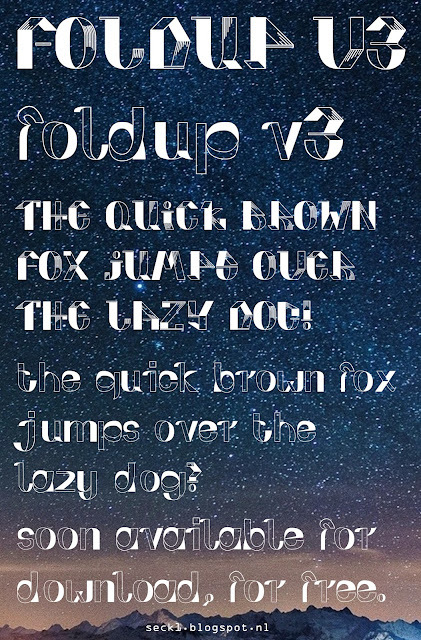 I proudly present you guys my FOLDUP V3 font! I received a couple of nice and kind reactions already, and as it is near the end of the year and christmas & the new-years celebrations are coming up, I want to give it away as a present! I tested it with Word, and the basic text editor from windows, but also with Photoshop & Illustrator CS6 on a Mac (I think it'll work on a windows machine too). It contains capital letters, small letters, 0-9, couple of math symbols, euro/dollar sign, and many more! This font was made for headers, not for writing whole books. Expect a creative letterstyle! Enjoy!